As many of you know, we’ve come out with a real time version of Beauty Box Video. 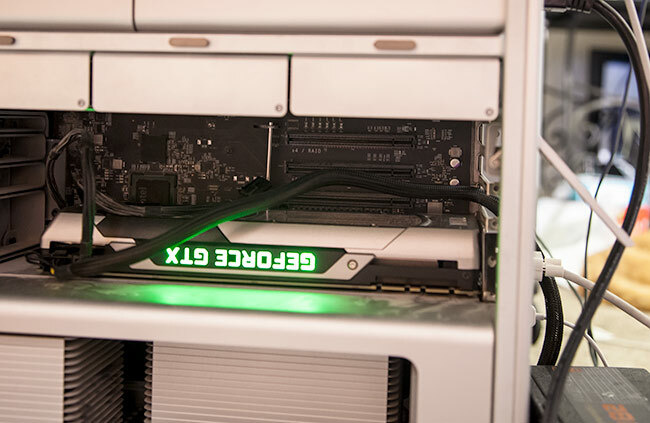 In order for that to work, it requires a really fast GPU and we LOVE the GTX 980. (Amazing price/performance) Nvidia cards are generally fastest for video apps (Premiere, After Effects, Final Cut Pro, Resolve, etc) but we are seeing real time performance on the higher end new Mac Pros (or trash cans, dilithium crystals, Job’s Urn or whatever you want to call them). BUT what if you have an older Mac Pro? Install those, set it to Web Driver, install the 980, and you should be good to go. What about the Titan or other more powerful cards? 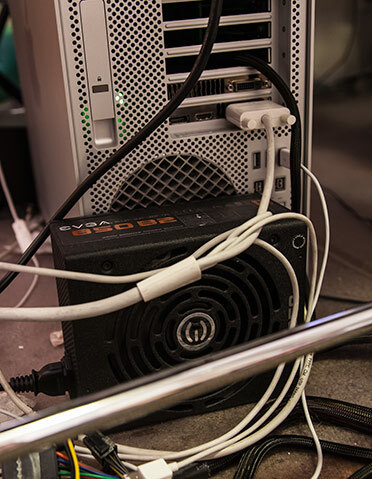 There is one small problem… the Mac Pro’s power supply isn’t powerful enough to handle the card and doesn’t have the connectors. The Mac can have two six pin power connectors, but the Titan and other top of the line cards require a 6 pin and an 8 pin or even two 8-pin connectors. REMINDER: The GTX 980 and Quadro do NOT need extra power. This is only for cards with an 8-pin connector. The solution is to buy a bigger power supply and let it sit outside the Mac with the power cables running through the expansion opening in the back. As long as the power supply is plugged into a grounded outlet, there’s no problem with it being external. I used a EVGA 850W Power Supply , but I think the 600w would do. The nice thing about these is they come with long cables (about 2 feet or so) which will reach inside the case to the Nvidia card’s power connectors. One thing you’ll need to do is plug the ‘test’ connector (comes with it) into the external power supply’s motherboard connector. The power supply won’t power on unless you do this. Otherwise, it should work great! Very powerful cards and definitely adds a punch to the Mac Pros. With this setup we had Beauty Box running at about 25fps (in Premiere Pro, AE and Final Cut are a bit slower). Not bad for a five year old computer, but not real time in this case. On newer machines with the GTX 980 you should be getting real time play back. It really is a great card for the price. Note that your line “REMINDER: The GTX 980 and Quadro do NOT need extra power.” Is not correct! I bought an Asus Gtx980 to use it in my MacPro, but it doesnt work. Now i noticed, that one of the LEDs on my card is glowing red, indicating that there is not enough power connected. I researched and found, that there are many 980 cards with 16 and 18 pin cable, like my Asus Gtx980. Not all GTX 980s are built the same. The stock card and some models like the EVGA one are 2x6pin, but most, especially the factory overclocked ones are 1×6 and 1×8 pin. Please keep this in mind when buying a 980 card. I went with the 4GB EVGA and it’s perfect, but it was the only one I could find with a 2x6pin connector.